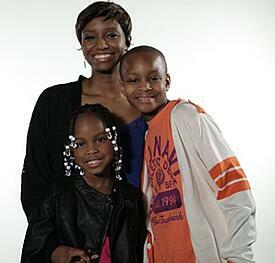 Shala is a 30-year-old mother of two children — a 9-year-old son and a 4-year-old daughter— living in Jackson, New Jersey. She’s a thinker who loves puzzles, hiking, bowling and spending time with her family. Shala’s experience with her alopecia, and her amazing attitude, has led her to embrace her baldness and help others in the process. Nikki Baldauf, Production Editor at Bloomsbury Publishing, recently interviewed Shala and put together her story. For other women with alopecia, I think you will find a lot of what Shala has to say very familiar to your own experiences. I began to embrace my baldness. It’s nice to show children that it’s OK to be different. I met a little girl, nine years old, at my son’s school last year, and she was going through the same transition. It was their Field Day and she was wearing the bandanas and whatnot. That day I’d worn a hat, but I took it off and told her “It’s OK. We’re all different. There’s nothing wrong with you!” And she said “OK!” and gave me a hug. It’s nice to wear the look and encourage children that it’s OK to be different; we’re ALL different in some way. Just embrace it! Only now that I’ve gone through this unfortunate experience do I realize that I am touching so many lives just by taking those steps —by taking off the wig, taking off the hat, and walking with high self-esteem each and every day. A chance to let our hair down! When I first started losing my hair, I Googled alopecia support groups. There weren’t too many in my area, but Bald Girls Do Lunch did come up. The next meeting was at the beginning of the month, and it was very supportive — an opportunity to meet other women with alopecia, to just sit and talk about some of the issues and problems that we all go through. It was an enjoyable experience — a chance to "let our hair down," so to speak! What I took away from it was that I’m not the only one out there dealing with alopecia. But it also reinforced that we’re all just fine, even without hair! We’re unique, lovable people. I would definitely tell any newcomers to go to a Bald Girls meeting. They’ll also come out knowing they’re not alone. Her son thinks alopecia looks good on her. Shala’s 9-year old son, Kyzier, wanted to answer some questions, too. Kyzier likes playing football and baseball, and loves chocolate ice cream. His favorite subject in school is math and his favorite superhero is Wolverine. To Ky, the most special thing about his mom is that she’s nice, and that she is really good at talking on the phone. Some of his friends know that his mom doesn’t have hair, and they are all cool with it. If Ky could give his mom any kind of hair now, he says it would be the same kind of hair that she had before; but he also says that his mom is happier without her hair. And the one thing he wants everyone to know about his mom’s alopecia? That it looks good on her! Be full of life, happiness and joy. Shala's advice: embrace your baldness, to be who God created you to be and stay positive. If you’re awkward, everyone around you is going to be awkward. But if you are full of life, happiness, and joy, people around you will develop the same type of feeling. There’s nothing wrong with you — you just don’t have any hair! Love who you are! Be proud of who you are. Stand tall. Continue doing, keep on pushing, keep on thriving! What do you think about Shala's story? Share your support and experiences in the comments! Want to read more stories like this and stay up to all of the latest going on with Bald Girls Do Lunch? Join our mailing list!